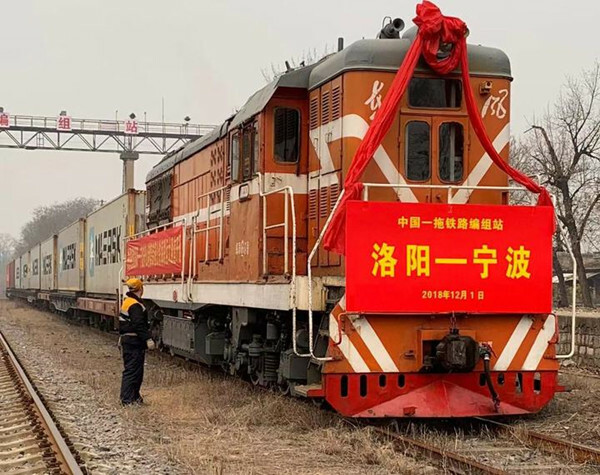 A new cargo train route has been launched between Luoyang city, Henan province and the Ningbo-Zhoushan Port, with the first train carrying goods produced by local companies setting off from Luoyang to the port in Zhejiang province on Dec 1. The goods were transported by road to the railway station before being loaded on the train to the Ningbo-Zhoushan Port. Upon arriving at the port, cargo on the new train will then be directly transported to other countries by ocean-going vessels. This is the second train route between Henan province and the Ningbo-Zhoushan Port dedicated for cargo to be transported overseas by sea, with the first route connecting the port with Zhengzhou, capital of the province having been launched in August. Luoyang is the eastern starting point of the ancient Silk Road and an important part of the China (Henan) Pilot Free Trade Zone. It has been accelerating its foreign trade with countries involved in the Belt and Road Initiative over the years. The new route will not only boost the foreign trade of local companies in Henan, but also increase the competitiveness of Luoyang and the province at large in the global trade market. Rail-sea intermodal transport has now become a new growth point of the Ningbo-Zhoushan Port. It has opened cargo train routes in eight of the 11 cities in Zhejiang province, with rail-sea intermodal transport business covering 15 provinces and 46 cities across the nation.